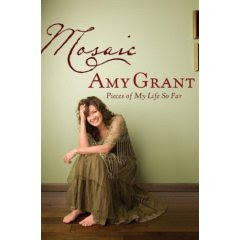 As a long-time Amy Grant fan, I was anxious to get my hands on this book. Finally having done so, I quickly devoured it. Unlike Sandi Patty's memoirs (Broken on the Back Row), Mosaic is not a tell-all. Rather it is what it says it is: a mosaic of her life so far. It is bits and pieces of this and that. In some ways it is unsatisfying and, in other moments it is completely explanatory. What I took away from this book is Amy's (excuse me for my familiarity) desire to take a positive outlook on life. She admits various defeats and struggles while remaining positive and hopeful. I am not really satisfied as to her exact standing on any theological issue, but I've no doubt of a sincere faith that is lived out on a day-to-day basis. Everything that she has done that has been questioned in Christian communities is downplayed in this book -- but not in a forceful way. It's a quiet skimming of the surface which politely refuses to answer direct questions and yet tells you all you need to know. It is southern politeness. I really can't say whether or not I liked this book. As an Amy Grant fan, I'd have to recommend it. As a book-lover, not so much! It's not something that I think I'd "HAVE" to own, but it IS something that I'm very glad to have read. And so, as vague as her book was (with some specifics), so shall this blog post be. No offense taken here. And no arguments either. I didn't like the divorce, but I still liked her music. Which, if you know me, is REALLY odd. I turned off Sandi Patty for YEARS. (It took reading her book to go back to it.) Amy's voice just "clicks" with me. So try as I might, I couldnt' avoid it and, in this case, tried to ignore the divorce. I'm saying this because you said you weren't interested in arguing -- and I'm not either. I don't think you would like this book. She skims past all the "issues" in her life. I read the interview that you mentioned. I've forgotten most of what she said. She certainly doesn't try to explain any more -- she struck me as being one who fully accepted her "position" and God's forgiveness and was looking at the bright and positive sides. She hints at troubles but only that -- a hint. Otherwise, it's upbeat, positive and joyful beside the pain. No, I don't think you would like it. And I totally identify with all of your feelings. For me it's just something about the voice . . . I am over here from The Saturday Review of Books. I got this for Christmas and probably had a similar reaction. It was an interesting read for those of us following Amy. I thought the baptism chapter explained a lot about her feelings of failure and repentance. Like you, I still suspect her theology though. I always felt bad for Amy in her marriage to Gary, Anon, since he did admit to drug use but that doesn't mean I am happy about their divorce. I think my own biggest disappointment with her was when she got her Hollywood star. I thought she was just foul that day. I have been mad at her too, and I actually read this book to try to let go. I mean, who am I to judge??? Yes, I think that her cavalier attitude towards her divorce was harmful to others, and honestly, I think that some of that still comes across, but I did sense some honest repentance, and there are some stories that really ring true as a mom, friend, sister etc.